Unfortunately you cannot argue against something, without at the same time advertising it, so here it goes. GW2 Raidar is a website that analyzes all uploaded arcdps log files and among other things compiles statistics on how popular certain professions at certain encounters are and how well players on average fare when playing those professions. Just to prevent any misunderstandings, I don't have any problems with this part of what the website does. However, I strongly object to the next part. When a member of a squad uploads a log file, GW2 Raidar compiles a statistic for this particular attempt. This is automatically added to the list of encounters the individual squad members have participated in, so in essence automatically shared within the squad. It also at this point creates a link, which can be shared with anyone, even outside the squad. This is something that can't be prevented. What this in essence means is, that any squad member can make this statistic publicly accessible and freely share the data with anyone (GW2 Raidar isn't the only website that creates shareable links like this, but I'll stick to this site in this post). If you don't want just anyone to know how often you got teleported at Vale Guardian or Cairn, you can adjust your privacy settings to at least not show your account and character's name. However, players that were in the squad will obviously still be able to deduce who you were. I wish website providers would finally properly understand how privacy settings are meant to work, because this should be the default setting. It is unfortunately not. (Moreover, "private" should in my opinion mean that my data isn't shared at all, not only that my name isn't shown... oh well.) 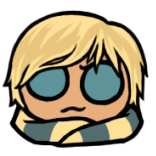 Anyone that wishes to set themselves to "private", will need to create an account and link an API key for an existing Guild Wars 2 account. Log into your Guild Wars 2 account here and go to the "Applications" tab. 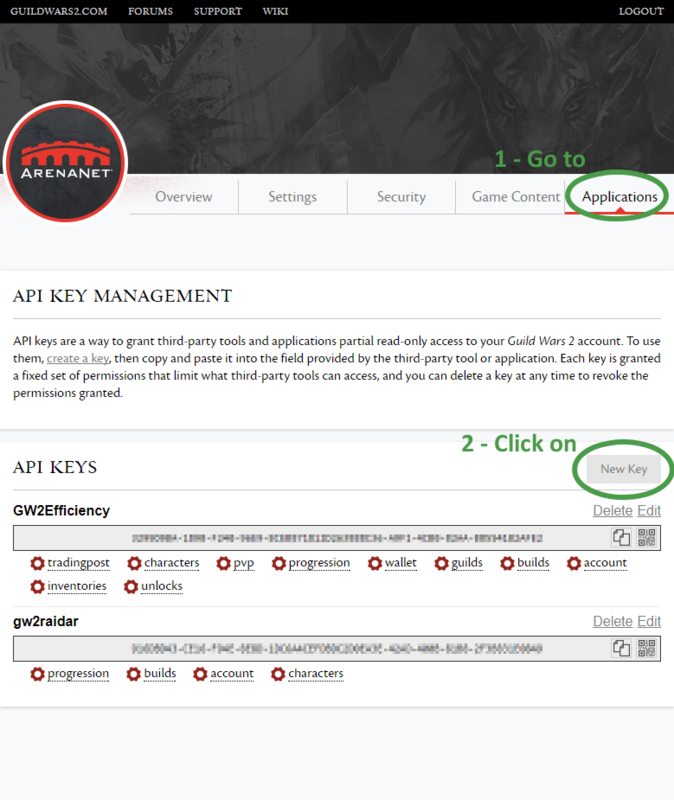 This will give you an overview of all your API Keys. 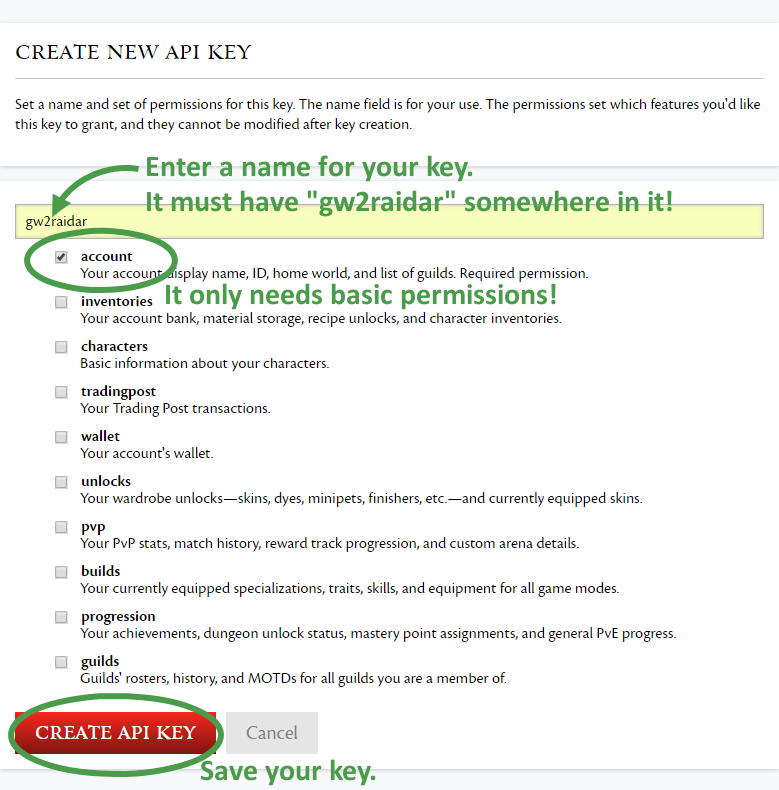 As you can see in the screenshot, I have already created a key for GW2 Raidar. 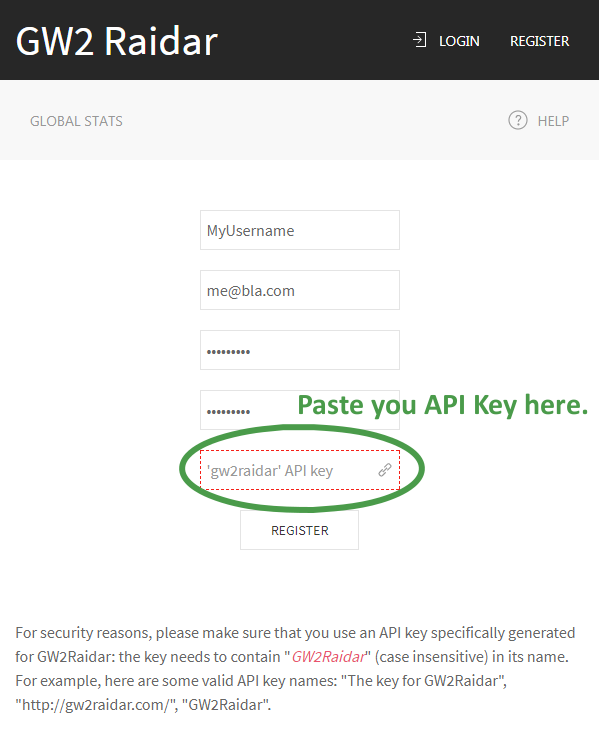 If you haven't, click on "New Key" to create a new API Key. Enter a name for your new API Key. According to GW2 Raidar's rules, this name must contain "gw2raidar" in some form, but it is case insensitive and can contain additional symbols. The only permission you need to grant is "account", which is required for all API keys anyway. Anything else is unnecessary. Once you are done, click on "Create API Key". The new key should now be listed in the overview. Mark and copy it. Go to GW2 Raidar and click on "Register" (the link should take you there). Enter Username, email address and a password (twice), as always when registering anywhere. I don't think you need to worry about providing an email address, so far the site has never sent me any and you don't need to confirm your registration. Paste the API key you created in Step 1 into the field reserved for it. 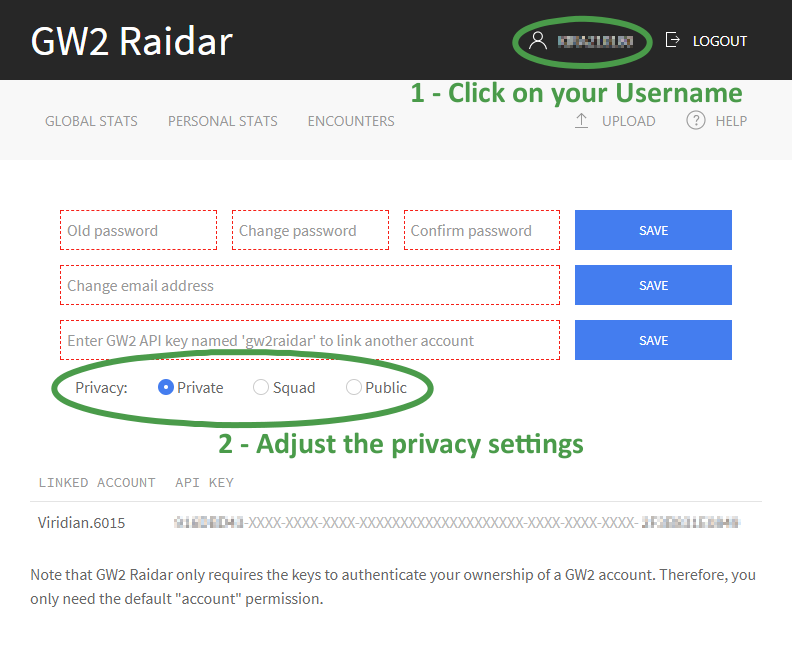 When logged into GW2 Raidar, click on your username to bring up the user settings. Here you can for example also add additional Guild Wars 2 accounts, should you have more than one. Adjust the privacy settings. There aren't many options. Your character and account names are now not shown to others anymore. Different people have different reasons for raiding. For some raiders, this website is an awesome tool and very helpful. For others it is shocking and scary that their performance data can be shared without them even being aware of it. In my opinion it should be up to each individual player to make the decision to participate in the website's program for themselves. I am sure nobody can deny that when used with malicious intent, the site could potentially cause quite a lot of harm to individual players. It would be nice therefore, if we could respect each others wishes and before uploading or sharing any data via this site (or any other, for that matter), ask the members of the group whether they are all ok with it. And if they are not, just skip uploading the data for that one raid.